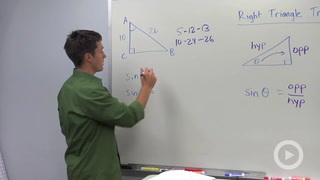 In a right triangle there exists special relationships between interior angles and the sides. And we're going to talk about just one ratio here and that is sine. Notice here it's spelt with an e and that's the full spelling. On your calculator, you're going to see s-i-n. It's still pronounced sine. 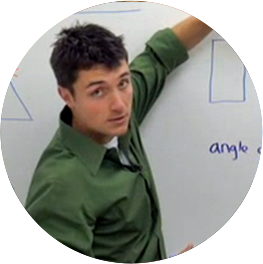 If you want to drive your Geometry teacher nuts, pronounce that sin. So the sine of theta, is the relationship between the side that is opposite of that angle. So the tricky part about Trigonometry is that theta could be either one of these angles. It will depend on which one you choose as how you would define sine. So here we're going to call the side that is opposite of theta the opposite side which I'm going to abbreviate with OPP. Now sine is the ratio of this opposite side to the hypotenuse, which I'm going to abbreviate HYP. So sine is the ratio of an angle, the side opposite to the hypotenuse. Now way that you could remember this is using SOH CAH TOA. And since we're just talking about sine right now, you can remember sine because it's sine is the ratio of opposite to hypotenuse. Cosine is the ratio of adjacent to hypotenuse and tangent is the ratio of opposite to adjacent. But right now we're just talking about sine. To illustrate this point of theta can be either one of these angles, let's take a look at a quick example. Over here I've drawn a triangle with vertices rs and t. And notice that the sides opposite them are the lower case versions. I'm going to say that the sine of r is going to be the relationship of the opposite side to the hypotenuse. So if I look at r, the side that is opposite is lower case r. So that's going to be the numerator of my ratio. The opposite side is r, the hypotenuse is t. So that's going to be my denominator. If I talk about s as my theta then, now my opposite side is lower case s. So that's my numerator and my hypotenuse is still t. That won't change. So notice that your sine can change depending on which vertex you choose, but it will always be the ratio of the opposite side to the hypotenuse.